The Valley is home to 18 VEX robotics teams made up of members like Alex Bowman (second from right) Andy Walker, Teagan Parkin and Mariah Rasmussen. Bowman’s team, Byte Me Robotics, was one of two local teams representing the region at the recent VEX Robotics World Championships in Kentucky. Photo by Boomer Jerritt. Do you remember the audio visual club from your high school days? If you do, you probably recall it was where you would find the students who were enamored with technology—the students who loved to tinker with wires, knobs and circuit boards, and who could work that troublesome video projector better than anyone, even the teacher. Obviously, things look a bit different today. If you were to scan through a recent yearbook from one of the local high schools you might not find an audio visual club. However, especially here in the Comox Valley, you would find a robotics club—specifically, a VEX robotics club. And just like the audio visual club back in the day, the VEX robotics club is where you will find the technology leaders of tomorrow—the CEOs of the technology-based corporations as well as the top scientists, mathematicians, researchers and engineers. You may never have heard of VEX robotics, but it’s been around for more than 10 years and it’s a pretty big deal. In fact, with more than 19,000 teams from more than 40 countries, playing in more than 1,300 competitions, VEX robotics is the largest and fastest growing middle and high school robotics program in the world. It’s hard to describe a VEX robot to someone who has never seen one. First, you need to remove the stereotypical robot from your mind, you know, the one that looks like R2-D2. You can also remove the robot that looks like a person covered in shiny metal. Oh, and wipe out any recollection you have of robots destroying themselves on TV, i.e. Robot Wars or Battle Bots. 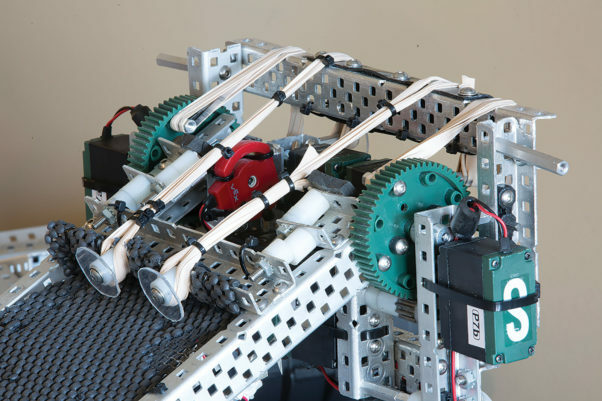 Basically, the VEX robotics program is based on a meccano-like system of parts—structural components made of steel or aluminum, plus wheels, motors, gears, pneumatics, sensors, a programmable controller—and of course, lots and lots of nuts and bolts. With these prescribed parts, students design, build and program their robot to address the engineering challenge put forth by VEX—a challenge that changes every year. These challenges encompass difficult maneuvers for a robot, such as gathering and throwing objects, reaching or travelling over and under things, expanding in height to place objects, and even attaching itself to bars and supporting its weight in a hang. The students have a few months to build and perfect their robots before they begin to gather for competitions. The Comox Valley is currently home to 18 VEX robotics teams. That may not sound like a large number at first, but it’s quite a bit when you realize that’s 12 per cent of the 155 teams in all of BC, yet our population makes up only 1.4 per cent of the total population of BC. Lance Balcom is the organizational head of the Pacific Youth Robotics Society (PYRS), a society created to increase the competitive robotic community in British Columbia. Balcom is aware of all of teams throughout the province, and he feels our Valley should be proud of the robotics community we are fostering here. Recently, two teams from the Comox Valley—Byte Me Robotics from the Cumberland Robotics Club and the Navigators from North Island Distance Education School (NIDES)—earned a chance to represent our region at the VEX Robotics World Championships in Louisville, Kentucky. They were joined by more than 560 teams from around the globe. 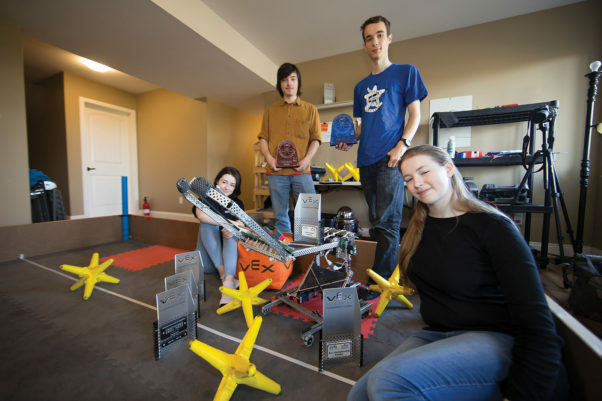 Byte Me Robotics is comprised of two students, Alex Bowman, who is the team captain and studies Grade 12 from home, and Kate Waddell, who is in Grade 10 at Highland Secondary. This is the second year that Byte Me Robotics has competed and only the first year that Bowman and Waddell have joined forces. The Navigators, from NIDES, is comprised of three team members, Sam Crouch (captain), August McClellan and Maggie Johnson. Actually, their team is one of many that compete under the NIDES banner. In fact, NIDES is a force when it comes to VEX robotics, as they currently have 11 teams and are growing bigger every year. This is the also the second time NIDES has sent a team to the World Championships, but that doesn’t dampen coach Stew Savard’s pride when he talks about his current students. It’s important to note here that when students study robotics they are essentially studying STEM subjects—science, technology, engineering and math—in an interdisciplinary and hands on manner. These four STEM subjects meet at the juncture called robotics. When students study robotics they learn mathematical and physical concepts such as gear ratios, the mechanics of movement and structural strength, as well as technological skills in areas such as electronics, control systems and computer programming. Arguably, however, STEM subjects are about more than the sum of their obvious parts, as educating students in STEM subjects prepares them for life, regardless of the profession they choose to follow. That’s because STEM subjects teach students to think creatively, critically, and how to solve problems. In fact, according to a recent report by the World Economic Forum, these three skills—complex problem solving, critical thinking and creativity—were listed as the top skills needed to excel professionally by the year 2020. Since VEX robotics is a team sport, it’s also necessary for students to learn effective ways to communicate abstract and complicated ideas with each other, and how to work as a cohesive team, oftentimes under extremely stressful conditions. In addition, perseverance, strategy, collaboration, innovation, and project management are skills that students of robotics take home with them. But the most incredible thing is that when students build robots, all this learning happens effortlessly and enjoyably. Imagine education that is as entertaining and addicting as video games. That’s what happens when the robot enters the classroom. Here’s a good example of how excited young people get about robotics and STEM learning: At the most recent World Championships in Louisville, Kentucky, the new engineering challenge for the coming year was unveiled with tremendous fanfare and excitement. The competitors in the stands were literally jumping up and down and cheering. But here’s the rub. Essentially, the students were being handed their STEM homework for the next year. Yet instead of shrugs and groans, the students immediately started coming up with design ideas and strategy to solve the new challenge. When do you ever see kids so excited about homework? Not often, but with robotics, you see it all the time. And this fun creates interest. In fact, 95 per cent of students who take part in VEX robotics report an increased interest in STEM subject areas and an interest in pursuing STEM-related careers—a fact especially important for girls. Gender disparity is especially prevalent in fields related to STEM subjects. In fact, here in Canada, women are chronically under-represented across all STEM-related fields, making up just 22 per cent of the science, tech, engineering and math workforce. The reason for this workplace gender disparity can be traced back to the school years, where it has been proven that girls are far more likely to lack confidence in their ability in STEM subjects compared to boys—despite the fact that girls often outperform boys in STEM subjects. Although it’s also true that girls are affected by gender stereotyping from the wider society in general, creating a shift in attitudes during the school years is a great place to affect positive change in this area. That’s where the robot comes in. When girls are allowed to freely create their robot, they are often surprised to see that they are just as good as, if not better than, their male teammates. For many girls, this realization constitutes a paradigm shift that will change the trajectory of their lives. Happily, there are a good number of girls who play with robots here in the Comox Valley. In fact, both local robotics teams who went to the World Championships have girls on their teams and Vanier Senior Secondary has a team made entirely of girls. Growing local interest in robotics, from all genders and ages, is important for the future economy of the Comox Valley. The world faces an unprecedented need for new innovators, thinkers, and problem solving leaders. In fact, some experts say we are at the beginning of a Fourth Industrial Revolution. For example, developments in previously disjointed fields such as robotics, artificial intelligence, nanotechnology, 3D printing, genetics and biotechnology are all building on and amplifying one another. It is also believed that at the current growth rate there are simply not enough students choosing STEM-related paths to meet the global demand predicted for the future. As a result, it’s incredibly important to find creative and innovative ways to get students interested in learning and embracing STEM subjects. Robotic education will prove to be an essential bridge to the future of innovation. Businesses in the Comox Valley and on Vancouver Island are recognizing the fact that we need to be supporting our young minds as we move into this Fourth Industrial Revolution. For example, our local robotics teams received a good deal of support from the Lift Comox Valley organization, a business and community economic development initiative designed to grow our local economy. Hans Peter Meyer is the facilitator of Lift and was instrumental at garnering the support for the local robotics teams. “It’s important for the business community to support these kinds of talented young people because they are the ones who are going to be building our economy in the future,” says Meyer.